I Have always wanted to set some expensive stones in one of my free form rings, but thought I should wait and set it in gold. Pshaw...why wait on a gold market as volatile as the current one. 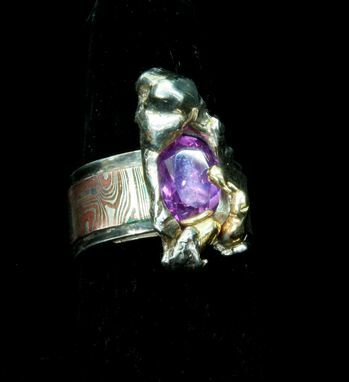 The stone is, according to my wife's eye, more Fushia rather then pink. It is a 3 ct oval Sapphire 7.7 x 6.66. It is heat treated and not a lab sapphire. I set the stone in free form silver with gold accents and a shank of silver with Mokume embellishment. My wife wanted to see how I made the free form silver so she stood while I poured molten silver into cold water. She flinched each time it sizzled as I poured. she became so excited with the process I was forced to continue to pour until she got the shapes she wanted. I add different pieces of the slag silver to achieve a final shape.